Thank you for your interest in Pro Group. We are a high energy company that looks for qualified individuals who are passionate about their work. Pro Group is an equal opportunity employer and complies with the American with Disabilities Act. If you require an accommodation in order to apply for a position, please ask for assistance from the Human Resources Department. If you are seeking a challenging career and a company with your growth opportunities in mind please come join our team. Thank you for your interest in Pro Group, the leader in self insurance group workers' compensation and captive insurance. Pro Group has three companies which include Pro Group Management, Pro Group Captive Management Services, and PGM Safety Services. Pro Group is the premier administrator of self insured groups for workers' compensation in Nevada. 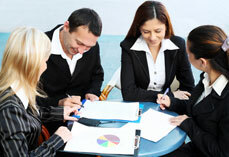 Pro Group secured certification for Nevada’s first four self insured groups in 1995. As the administrator we provide the groups with comprehensive oversight management which results in increased workplace safety, effective claims management, lower claims cost, reduced rates and full compliance with the Nevada Division of Insurance. In 2002, Pro Group formed Pro Group Captive Management Services in order to deliver alternative risk programs to our clients. Pro Group Captive Management Services has formed and managed over 70 captives of all sizes and types in a wide variety of risks and coverages from an impressive group of companies ranging from large corporations to smaller family owned operations. Pro Group Captive Management Services is the premier captive manager in Nevada responsible for nearly half of all licensed captives in the state. We also offer captive management services for those choosing to domicile in Arizona or Utah. PGM Safety Services formed by Pro Group in 2000, to coordinate the safety needs of the self insured groups administered by Pro Group. As a qualified member of the self insured group, the professional services of PGM Safety Services are provided through your membership. Members can take advantage of this benefit by obtaining safety instructions, complying with Federal & State regulations, establish a safety program, in addition to protecting valuable employees. Pro Group has three locations with the corporate office located in Carson City, and other branch offices located in Las Vegas and Elko. Between the three locations we have over 50 employees and we are very proud to be voted one of the best places to work in Northern Nevada. At Pro Group, we have a very dynamic team who are dedicated to provide the highest level of customer service to our members. If you are seeking a challenging career, with an exceptional salary/benefit package and growth opportunities please apply today.